Current high school freshmen (9th graders who will graduate in the spring of 2017) will face a different SAT. The changes aim to make the test more relevant to learning and less susceptible to test prep. What they really do is demand a new kind of test prep. Last month, David Coleman, President of the College Board, announced significant changes to the SAT. The new test will be shorter, as the Writing and Critical Reading sections will merge into Evidence-Based Reading and Writing and the essay will become optional. The scope of the Math section will narrow to focus on basic quantitative and algebraic reasoning (sometimes without calculator use) and possibly add select, more advanced topics from the high school curriculum. Every test will feature reading passages from either America’s founding documents or other statements related to freedom, justice and human dignity. All of the new test’s questions will focus on critical thinking and reasoning that relate to either the real world or what students learn in high school and need to know in college or both. Student scores won’t change much. The current test strongly favors confident readers who feel at home with numbers and love solving problems. If your child understands math and loves to read, she will enjoy the same enormous advantages on the new test that she would have had on the old one. If your child learns math by rote, depending on a calculator for even the most basic calculations and/or reads only the minimum required assignments, he will face the same steep challenges he would have faced with the current test. Still, these are far-reaching and wonderful changes. Like many important education reformers these days, Mr. Coleman seems to have scant experience teaching actual students. As a result, he doesn’t understand just what he’s up against, a challenge I’ll address below. His reforms, however, represent the kind of idealism that too much practical experience might have blunted. Coleman has blazed a brilliant trail through the murky mess of secondary education. He offers a beautiful and profound vision for what our kids should learn, and his redesign of the SAT gives teeth to his vision. You have no idea how hard kids will work for an SAT score. While the old test wasn’t as bad as most people think, the new one promises to unmask the flim flam of tricks-and-shortcuts test prep and harness all that energy for much deeper learning. Before taking the helm at the College Board, Coleman was the prime mover behind the Common Core, a set of national curriculum guidelines for K through 12 education, that began taking effect this year in all but a handful of states. Coleman grew up in Manhattan. His dad was a psychiatrist. His mom was the president of Bennington College. Young David graduated from Stuyvesant (highly-selective, test-in, public high school) and Yale, where his tutoring of poor kids in inner city New Haven helped earn him a Rhodes Scholarship. His animating educational idea seems to be that we must give all students high standards to shoot at. High standards motivated him. Passing kids along or celebrating mediocre accomplishments does them a disservice and cripples our future workforce. Set the bar high, argues Coleman, and we will discover that kids aren’t so dumb while giving them the opportunity to truly excel. When Coleman took the job at the College Board in 2012, I thought maybe he had flamed out. For an educational visionary who just reshaped the entire national curriculum, becoming president of a venerable, some would say hidebound, testing organization seemed like the CEO of a car company becoming Ambassador to Italy – a dignified sinecure for an old lion who’d finished defending the pride. I was wrong. The notion that these crucial tests could be beaten with a few shortcuts took hold with the public and test prep has become a major business with $4.5 billion dollars in annual revenues. For most, test prep has come to mean a reductive message – “The test is stupid! 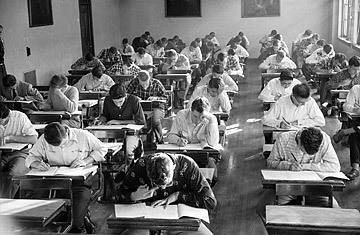 You can beat it with tricks!” – coupled with a brutal regimen of weekly, four hour practice tests. While no one can prove these efforts work (the College Board’s studies insist the average increase is only 30 points on a 2400 point scale), fierce competition for college admissions drives parents to invest money and students to invest time. Coleman is a genius. He didn’t take over the College Board to free up time for his hobbies. In less than two years, he has completely rebuilt the SAT to align with his Common Core. Just as educators are beginning to seriously grumble about and predict the demise of the Core (states only adopted it so as to claim federal “Race to the Top” dollars during the recession), Coleman has lashed the test, the SAT, to the Core. He’s aligned test prep with what goes on in school and what colleges demand. With any luck, his new test may actually correlate with students’ college performance – a game changer if he pulls it off, as, amazingly, neither the SAT nor the ACT has ever fulfilled that obvious criteria for a college admissions exam. Moreover, Coleman has thrown down the gauntlet to my industry. If, as promised, he has succeeded in eliminating the effectiveness of tricks and shortcuts, where will all that money, time and effort go? Simple. To survive, the test prep industry will have to devote itself to the values of the Common Core. I had been dreading the day the SAT would change. I started Veritas Tutors, because, tutoring on my own, I had found that shortcuts and drilling failed most students. Over the past 14 years, we have built up a set of practices that use test prep to remedy weak quant skills, raise reading levels and make students better at thinking. I feared that, as the more rote, bland ACT ascended, the SAT would regress to the mean in a race to the bottom. In my wildest dreams I couldn’t have imagined that the redesign would instead make the SAT a better learning tool. But Coleman’s plan needs help from the test prep industry. Setting a high bar does nothing to address the many obstacles to academic excellence faced by almost all students. Anyone who’s devoted a serious effort to changing an actual student’s performance knows that failure rarely begets success. The vast majority of students are not David Coleman. When David Coleman and others like him whose success at school has led to positions of power take tests, the words come smoothly off the page. Their high-functioning brains process accurately and produce thorough understanding and credible impulses. Such people have genetic predispositions for book learning, grew up in exceptionally stimulating environments or, most likely, both. The average high school senior reads on a fifth grade level. That’s not because everyone in high school is stupid or lazy. Most kids lack the stimulus to read the stuff Coleman wants them to read. Their parents don’t read either, so they’re not around much printed matter. Furthermore, from what we’ve learned working with students one-on-one, even those who are desperately motivated to succeed often face formidable cognitive obstacles. No one – not even David Coleman, reads like a barcode scanner. Our eyes misread or skip over words. Then, even if we read them correctly, our brains stumble trying to process them, either missing important details or embellishing based on prior expectations. If the test prep industry can figure out how to back Coleman’s idealism with actionable resources for students, SAT prep will offer a huge, private-sector boost to the Common Core and to the nation’s overall academic success. The College Board’s pledge to offer free “test prep” – practice questions with explanations – through the Khan Academy website barely scratches the surface. Raise quantitative abilities – Too many students learn math by memorizing formulas they don’t understand and rely on calculators to do all the work. Test prep will need to provide all students with a second shot at the basics before college and adulthood. Raise reading levels – If you understand what you’re reading, the test just isn’t that hard. Most students struggle with comprehension. We teach all of our students close reading and rhetoric skills and insist that they read widely and cultivate a passion for reading. To succeed, everyone else in test prep will need to do the same. Improve thinking abilities – Is intelligence fixed genetically like height or can people get better at reasoning the way we can at running or jumping? For us, test prep has always been about big leaps in cognitive abilities through thinking efficiencies. I’ll need a separate post to explain, but suffice it to say that most of our students have been willing to work hard at these skills and even the most able benefit from coaching in the use of their big brains. Veritas has a head start. We’ve always seen test prep as much more than tricks, but over the last couple of years we’ve been building web apps that get teens reading broadly and deeply. You can check out what we’ve built so far here. The main thing that’s hard about the SAT right now – the fact that you cannot control the outcome by simply memorizing a limited set of data but must be able to read, think and understand numbers – that will not change. What will change is that, instead of a few tricks and tons of rote practice, test prep will need to squarely focus on both content knowledge and reasoning – big changes with the potential to make a big difference. Balf interviewed me for this piece, but I can see how my message – that test prep could actually be a good thing – would have disrupted his narrative.